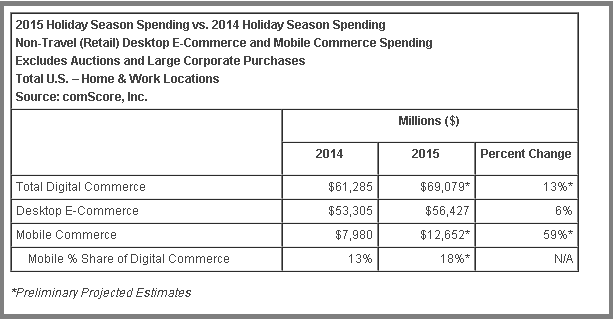 comScore has reported an increase of 13 percent with total online sales for the holiday season, reaching USD 69.1 billion, compared to USD 61.3 billion spent online during 2014 holiday season. USD 56.4 billion was spent online on desktop computers, marking a 6-percent increase versus the corresponding days last year, while online sales from mobile devices increased to USD 12.6 billion, marking an increase of 59 percent. 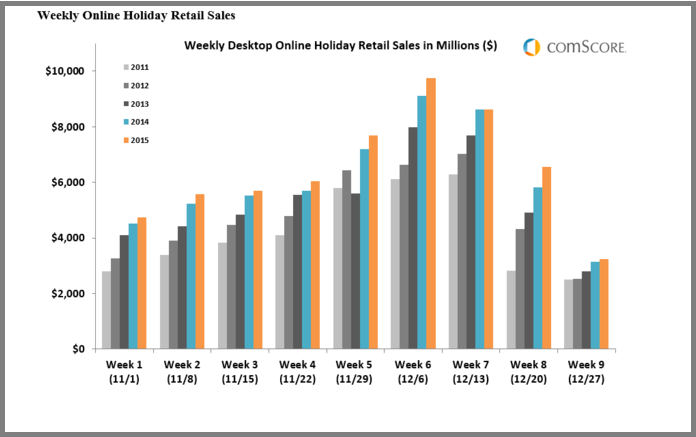 According to comScore report, the Online Sales were highest for the Week starting December 6, the sixth week of Holiday Season. Cyber Monday was the leading Sales day, sixth year in a row, with more than USD 2.2 Billion spent on Desktop Computers alone. Mobile commerce is estimated to have accounted for 18 percent of total digital commerce in November-December 2015, an increase from 13 percent in the previous season. Sales for the week of Thanksgiving, on average from Thanksgiving Day through Cyber Monday grew at 10 percent. The shortfall of projected Sales Growth for Free Shipping Day could be on account of launch of services like Click and Collect, as reported by The Washington Post, Forrester Research has found this year that some 42 percent of online shoppers have used click-and-collect. Retailers need to prepare themselves for challenges of Click and Collect services, by adequately staffing for key sales events and opening convenience stores or pick-up locations and increasing distribution points. 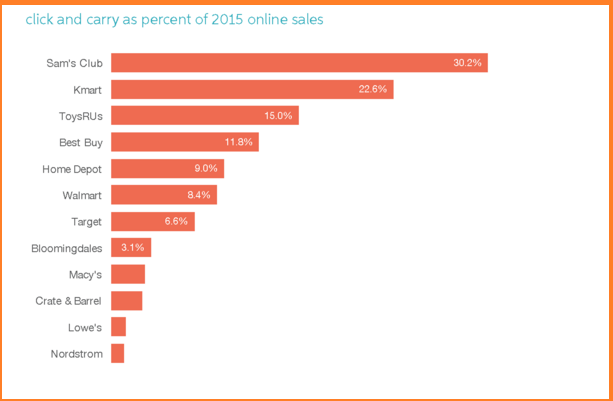 According to Slice Intelligence, Click and carry has accounted for 6.7 percent of online sales for 12 retailers. Equally important is the role of services like Amazon Prime that offer convenience of shopping and faster and free shipping. To combat Amazon’s success with Amazon Prime, Walmart unveiled a shipping pilot called ShippingPass in May. According to Millward Brown Digital, Amazon Prime Members bring in big revenue, with 63 percent of Amazon Prime members converting on the site in the same shopping session, almost five times the conversion rate of non-Prime members. The pure-play e-retail giant captured 39.3 percent of e-commerce sales from Nov. 1 through Dec. 6, up from 37.9 percent year over year, according to data from e-mail receipts of 3.5 million shoppers Slice evaluated. Meanwhile, sales on Amazon’s marketplace rose 19.5 percent in the second week of December, beating the e-commerce growth overall of 15 percent, according to ChannelAdvisor, which helps sellers on Amazon’s marketplace. More than 3 million people joined Amazon Prime in the third week of December alone, 200 million items were shipped for free to Prime subscribers, and more than two times as many Amazon devices were sold than last year during 2015 holiday season, according to The Verge and Amazon’s Press Release. comScore’s holiday season forecast had expected desktop e-commerce to grow 9 percent to USD 58.3 billion and mobile commerce to grow 47 percent to USD 11.7 billion. While desktop spending fell short by 3 percentage points and USD 1.9 billion, preliminary mobile estimates suggest it exceeded forecast by 12 percentage points and nearly USD 1 billion, making for the shortfall on desktop. According to Marketing Land “Much has been made of online retail surging and traditional retail suffering. But that “either/or” analysis is simplistic. Among online-only players, it’s really only Amazon and a couple of others that saw significant sales growth. The rest of online shopping gains came largely from traditional retailers’ online divisions. Though the Desktop Online Sales fell short of the estimate, the Mobile sales exceeded the Forecast by USD 1 billion, suggesting that the mobile shopping may be more popular for online purchases than expected. According to a report by Fierce Retail “Click-and-collect also proved popular with shoppers as nearly one-third opted for the service and a whopping 69 percent made additional purchases at the time of collection”. Macy’s CEO Terry Lundgren said in a statement that the department store broke its own record by filling 17 million online orders during November and December. 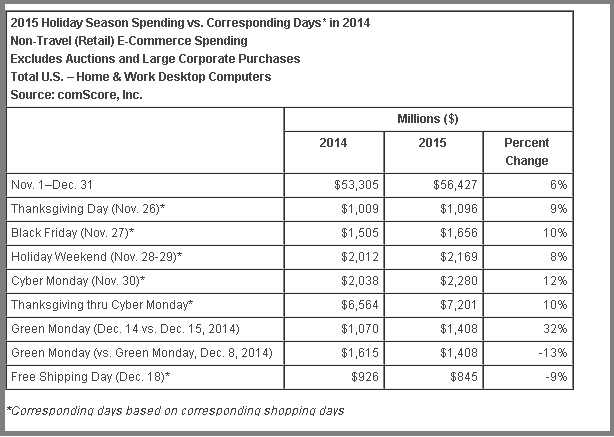 Amazon, by contrast, filled 23 million on Cyber Monday (Nov. 30) alone. 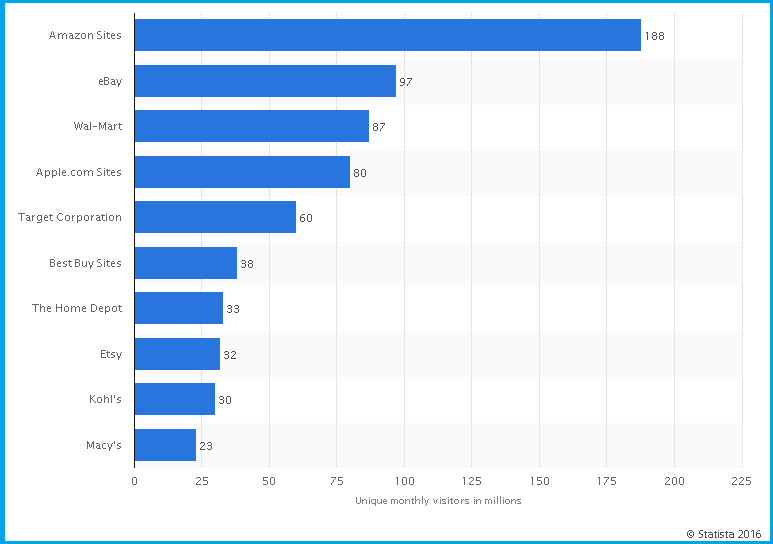 The unique visitors to retail sites shows that Amazon has a lion’s share of Online retail site visits. Omnichannel retail efforts can be boosted for online customers by providing easy interface at a physical location and faster shipping options. Amazon recently announced Amazon@Penn, a new staffed package pickup point to be opened on the University of Pennsylvania campus. The first such facility at an Ivy League university, Amazon@Penn offers the Penn campus community a convenient location for members of the Penn Community to pick up and return their Amazon orders. 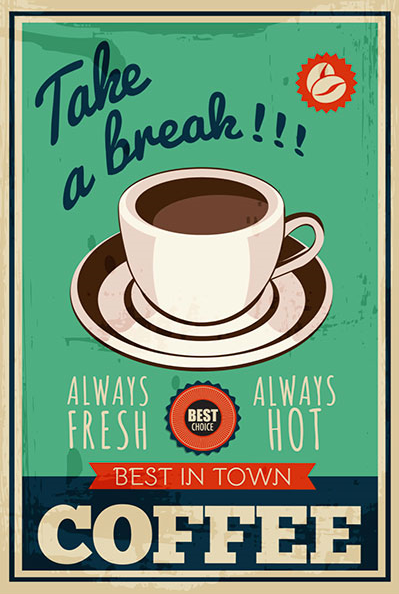 Eight Ways To Win At Omnichannel Retail.